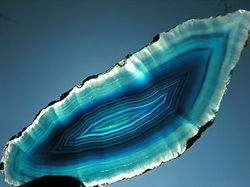 We are offering Semi Precious Stone Slices. Part of the nature’s repertory, these stones are exceptional raw creations, admired and appreciated since pristine times, been classified by their gems under the renowned name of semi precious stones. These stone has been created in nature’s mysterious laboratories, over many thousands of years, these stones are just one of the sources forms where the absolute beauty originated. their structure is a perfect architecture of small crystals coming in an infinite array of colors and depths. These semi precious stones expressing the essence of stylishness, class and beauty, are the ultimate touch of perfection for any interior, from classic to modern, from romantic to contemporary... a large choice of textures and colors expand and enhance their ability to fit any interior or design. we can create unique, exclusive pieces with any dimensions and also a variety of applications including kitchen & bathroom surfaces, work surfaces, counter tops, floors, walls, furniture, special features and more. We pride ourselves in the fact that all our products are handmade and possibility of our client to supervise the building process. this way we are sure that Divya Gem Stonex quality and design will exceed your expectations and you will have already established a personal relationship with the product.